We love our artists, and we know you will love them too! Each one is a fantastic artist, unique personality, and a fun entertainer! Above all else, they are here for you and aim to inspire your creative side. Meet Hue’s incredible artistic team…. Hue’s Master Artist BJ is a painter who typically works in the abstract and landscape genres, often combining the two styles. Regardless of the subjects presented on the canvas, BJ’s main focus is always color. Having grown up in Pittsburgh, PA alongside the steel mills and railroad tracks, her childhood was filled with grey, grimy days. To experience any kind of brightness, she had to create it herself. Over the years, BJ has formed her own unique style of art based on her use of self-proclaimed “Bubblegum Pop Colors”. Not for the faint of heart, she brings bold bright hues to the forefront of every painting. These days, you can find BJ in her home studio in Sacramento, CA, working diligently to bring a little extra color into a black and white world. She strongly believes that everyone deserves beautiful art in their homes, and is extremely excited to bring her social art skills to Hue Paint & Sip Sacramento. Remember, there is an artist hiding within each of us, we just have to set that artist free! You are sure to have a blast creating your very own masterpiece with BJ at a Hue Paint & Sip event! Click here to view BJ’s work online. Miranda Trusty is inspired by materials and motifs found in nature that are not traditionally associated with fine art. Be it mold, fungus or decomposing wood, Trusty finds beauty in the cringeworthy and transposes this found imagery into her abstract oil paintings. The artist is most recently known for her series of small works depicting a variety of intricate fungus and bacteria growing in petri dishes. Originally from Georgia where she completed her degree in painting at Savannah College of Art and Design, Trusty now resides in the Sacramento Valley with her husband, Nate. 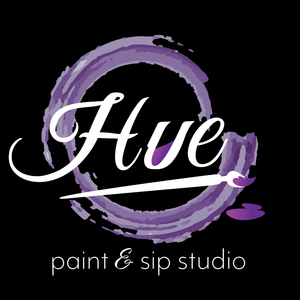 To satisfy her passion for creativity, the artist works at Hue Paint & Sip Sacramento as a Social Art Instructor in addition to planning and producing local events. Click here to learn more about Miranda.